Yesterday was the start of the daily paintings for 2017! Yay! This is Scylla, a silken windhound. You can see them from the side, but barely from the front. They are that narrow! I can’t believe I didn’t post this at the time! 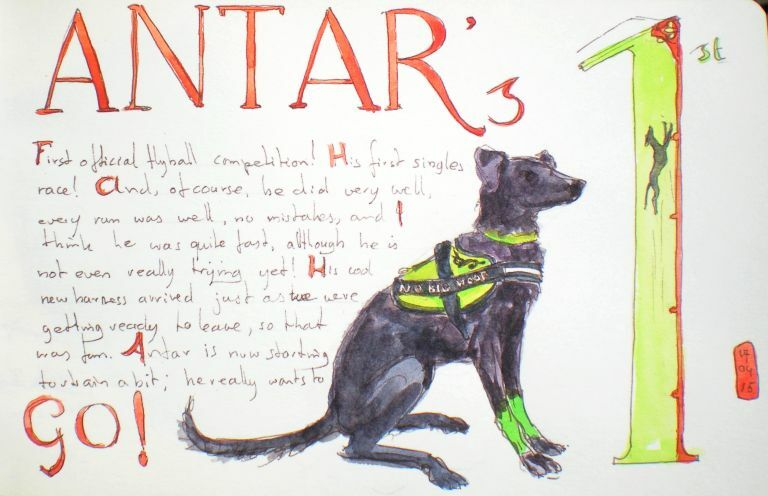 fact is, Antar’s his first official flyball competition was a great success! We had a wonderful time, lots of fun, and Antar did really well! Of course that is to be expected from a Fekete Kutya, but en verité, I am still all excited and rosy when I remember. Everything was good, we camped out. Antar had fun racing. nice friends, our team is the best, but we had a lot of fun in the evening with the other team’s members who also are the best! Of course lots of amazing dogs besides Antar! Antar has to get his paws wrapped. It looks funny, you usually do that on a horse, but why on a dog? that black dot is where the small pad gets rubbed on the mats, and if he didn’t wear the wraps they would have been bloody! That’s what happens if a Fekete Kutya goes flat out! A couple of people were going to stay in tents, so I brought my super mini trekking tent. The Eureka Moonshadow. It was Antar’s first time sleeping in a tent. Which meant that we didn’t sleep a lot. There was also a massive thunderstorm. It was expected, so we all set up underneath a large open barn, which turned out pretty good. 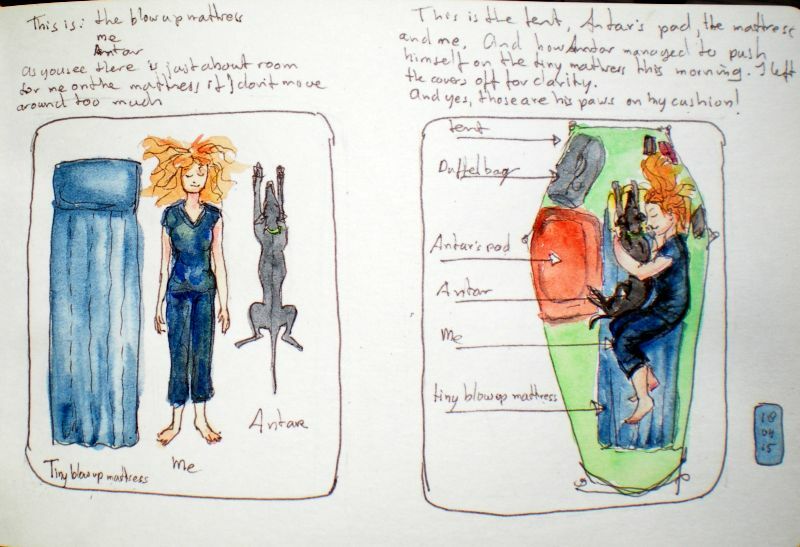 Here you see my mattress, me and Antar… And how that works out in the real world…. Memo to self: need a larger tent and mattress….. The second day Antar got to race in the team! He got even more excited in the team! It’s more complicated though. Luckily coach was right next to us to keep and eye on us and tell me what to do when. Antar did great. Except for the Fekete Kutya victory lap at the end of the last race, but he had passed the finish line so the race was officially over so it didn’t matter. Except for me looking like a bad dog trainer. Not everybody understands the challenges of training a Fekete Kutya. The Fekete Kutya should be of an elegant streamlined build, but never slight or delicate. The legs are long and straight, with a sizable paw. The back is straight, with a slight bend at the rear, a roach back is not acceptable. The tail is long and slender, with a slight upwards bend. The head is long and narrow with a sharply pointed nose. The ears are small and floppy, but capable of many diverse expressions. The eyes are small, dark brown and have an almond shape. Medieval tapestry, embroidered with coloured wool thread on linnen, showing a Fekete Kutya hunting the Hungarian Furry Gerbil. Used for hunting, one of the most important prey animals for the Fekete Kutya was the now extinct Hungarian Furry Gerbil. 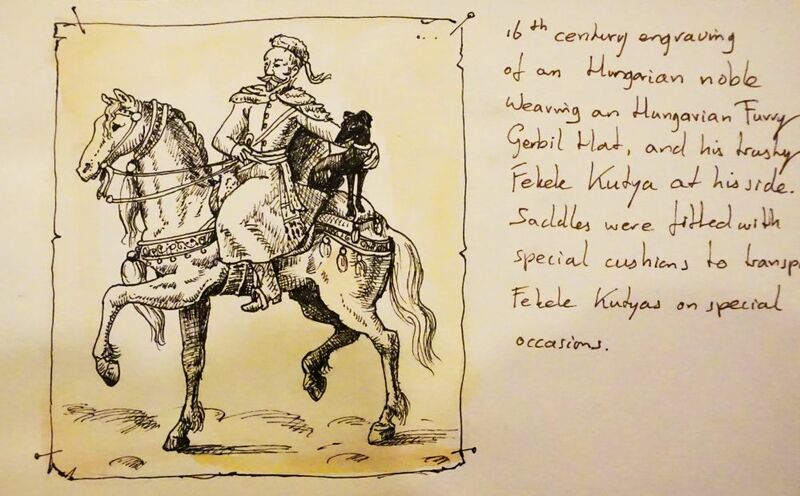 The traditional hat worn by the medieval Magyars was made of Hungarian Furry Gerbil skin. These small, ball shaped rodents were notoriously difficult to hunt but proved no match for the speed and agility of the Fekete Kutya. 16th century engraving of an Hungarian nobleman wearing an Hungarian Furry gerbil hat, his favored Fekete Kutya at his side. The dogs were trained to ride on a special cushion attached to the saddle on certain occasions. 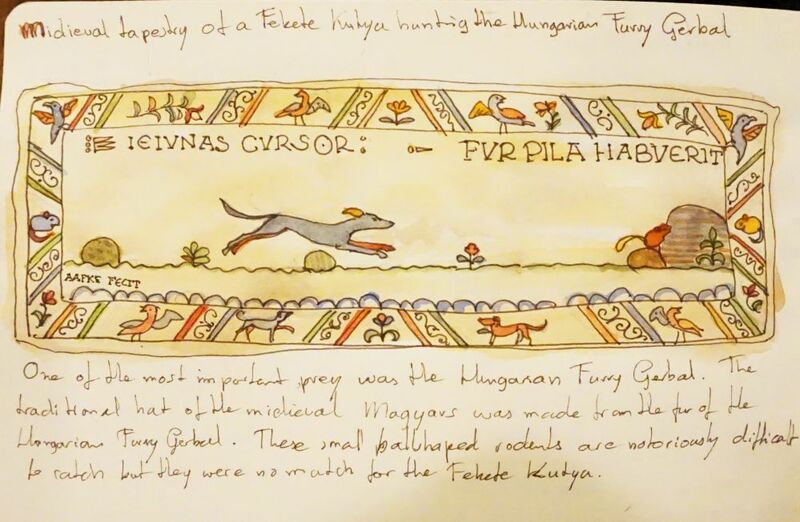 The Fekete Kutya became such an outstanding hunter of the Hungarian Furry Gerbil that the animal is now extinct. However, the hunt for these rodents is so ingrained in the Fekete Kutya’s genes, that even today all Fekete Kutya’s have an insane, deranged, and manic obsession with balls. The Fekete Kutya is extremely fast, needs daily exercise, and preferably participation in sport. Especially flyball. In fact the modern sport of ”Flyball” originated from the medieval Furry Gerbil hunt. When not exercising or at sport the Fekete Kutya will enjoy lounging on a luxury dog bed, next to you on the couch, in your bed, or actually on top of you. 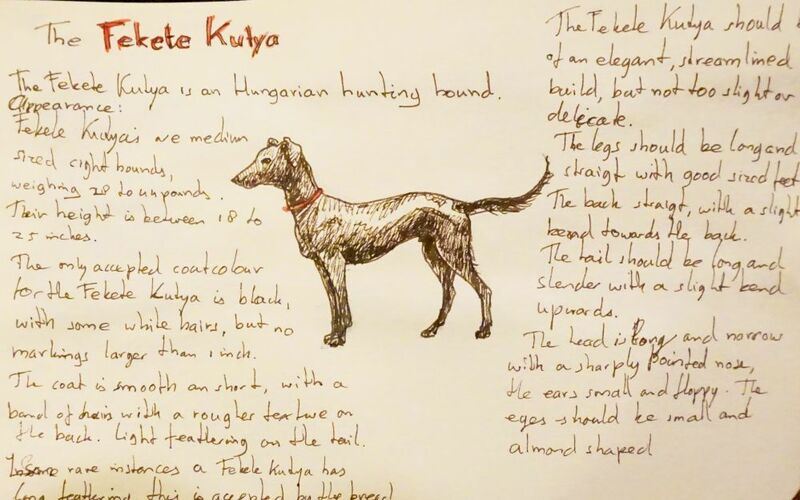 The Fekete Kutya is famed for it’s intelligence, and these dogs are beyond compare in training humans. They also have a mind of their own. 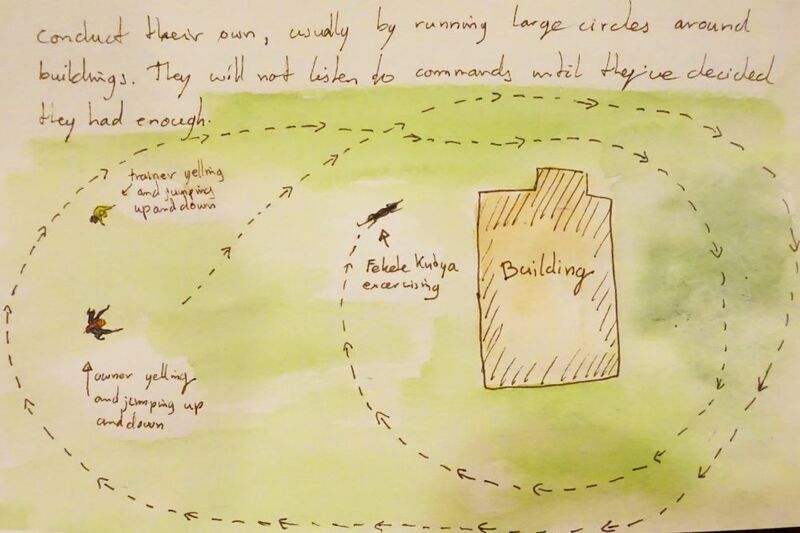 If, for example, the exercise offered is not up to par, according to the hound, they will conduct their own plan, which usually means running very fast around a building while the owner, trainer and various other persons call and yell for it to come back. However, the Fekete Kutya never listens to commands unless it feels like it. As the sport of flyball is derived from The Gerbil Hunt, the Fekete Kutya is the most perfect dog for this sport. In fact the Fekete Kutya evolved with the sport. In the early 18th century both the Hungarian Furry Gerbil and the fashion for Hungarian Furry Gerbil hats were on the decline and instead of hunting the sport of flyball was invented and had started to become very fashionable in aristocratic circles. In the 18th century the first rules for flyball, or ”Le Sport de Balle Volent” as it was named due to the universal popularity of French as the European Lingua Franca, were established, and for the first time special equipment was designed for Balle Volent. Three jumps, made of concave boards but with a fixed height were put out by the servants on a specially cut grass run, this was named ”La course”, At the end of la course was a square wooden contraption, ”La Boîte qui frapper la Balle”, it contained a rabbit fur covered ball and spring which, when pulled by a servant, would release the fur ball, ”Le Pouff”, in imitation of an Hungarian Furry gerbil. The dog would snap up the ”Pouff” and run back to it’s handler, who also had a Pouff on a silk ribbon, which was meant to entice the dog back and reward the dog by having another ”Pouff” to catch. This is my favorite technique for my sketchbook. This is pretty fast so good for work-on-the-go. I don’t have too much bulky stuff in my travel gear, and you still have precision and colour. 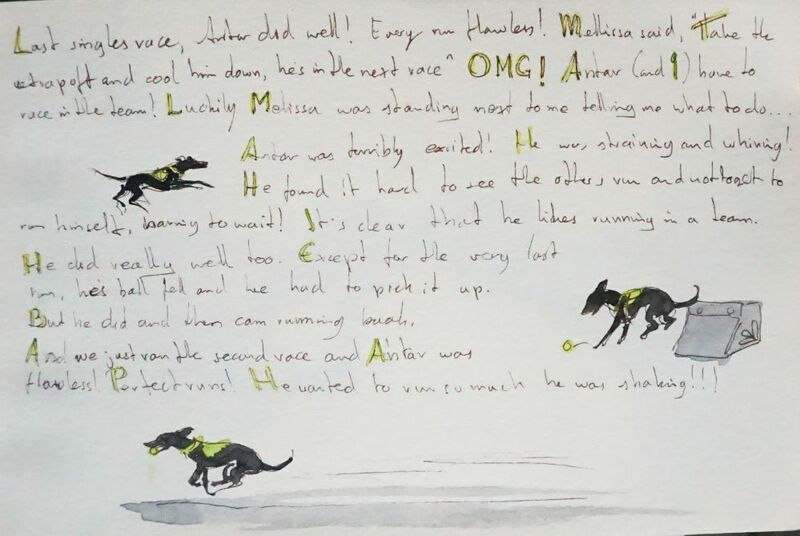 Of course you can also work just in pen or water colours, but this is fast and it looks good. At least that’s how I think about it. In this case I used a drawing pen. The Sakura Pigma Micron 03 in black. These have been favorite pens for years. I have them in black and sepia. Very reliable and water proof. So you can add a water colour wash. 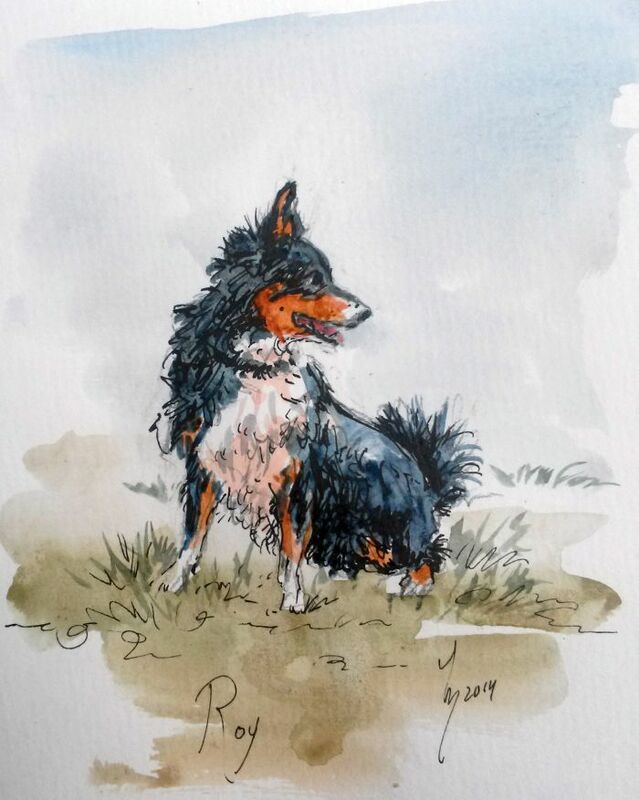 The water colours are my trusted Winsor and Newton watercolor set, the same one I have been lugging around with me for 20 years now!